I had a lovely time during Book Week Scotland which runs through the last week in November. 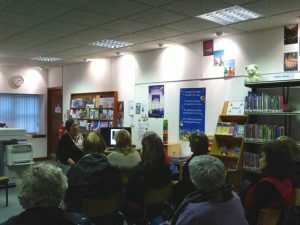 I gave talks in a couple of Aberdeenshire’s Libraries, including New Pitsligo and Balmedie. 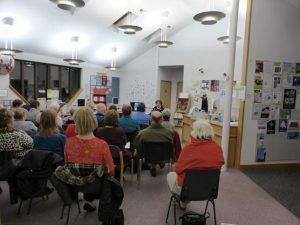 There was a great turn-out at both and some really interesting questions. New Pitsligo was a very appropriate place to talk about the gallant Lord Pitsligo of the 1745 Jacobite Rising as he lived near there. A loyal supporter of Bonnie Prince Charlie and the Jacobites, Alexander Forbes was also a scholar and a gentleman and an enthusiastic advocate of education for girls and women. Check out my brief blogpost on him: Lord Pitsligo. The organizers of Book Week Scotland are the Scottish Book Trust, who are a very lively bunch, always looking for ways to promote reading. One brilliant idea they had this year was to ask writers and readers to send a love letter to their local libraries. This initiative really caught the imagination and there are some wonderful examples on here.